Wheelchairs are a powerful asset to those who are unable or have difficulty walking, but for seniors who are able to walk for short periods of time, the mobility scooter is often a better choice. Mobility scooters are similar to wheelchairs in functionality, but use a different design and typically cost less than an electric wheelchair. Mobility scooters, which are often called adult scooters, have a much longer base that an electric wheelchair does. The base, which is made out of molded plastic, has one set of wheels in the front and another in the back, although many are three wheeled, so only have one wheel in front. The user sits in a chair that is positioned more towards the rear of the scooter and a tiller, which is similar to a set of handlebars, extends from the front of the scooter and is used to control it. The tiller usually allows the scooter to not only be turned, but also contain a key locking mechanism, speed controls, and is used to control any other accessories, such as horns and lighting. Many also come with a basket that is attached to the front of the scooter, although even those that do not can be fitted with an aftermarket basket. Mobility scooters utilize rechargeable batteries, which mean unlike gasoline scooters, a mobility scooter can be used indoors and outdoors. The per-charge range varies by model, with most allowing for at least a 4 mile per-charge range. Travel scooters, which are designed to be very lightweight, can be taken apart into several pieces, with the heaviest piece usually not weighing over 30 pounds. This way, the scooter can be taken apart and placed in the rear of a vehicle, without having to use a scooter carrier or lift. Of course, to reduce weight many of the comfort features are removed and travel scooters usually have a lower weight capacity and per charge range. Heavy duty scooters, on the other hand, are almost the complete opposite of a travel scooter. They are designed with performance in mind and have a much higher weight capacity and can often travel over 20 miles on a single charge. With larger tires and higher ground clearance, as well as reinforced bumpers, heavyduty scooters are also have much better performance outdoors and across rugged terrain. However, since they are so much larger in size, it is necessary to use a vehicle scooter lift to transport them. Even though they, like most mobility scooters, can be disassembled into several pieces, the individual pieces are much heavier than those of travel scooters. The Adult Scooter is often a lower cost alternative to the electric wheelchair. However, due to its design, a mobility scooter can not be driven directly up to a table or desk in the same way a wheelchair can. As a result, most people who use mobility scooters can walk for short periods of time. There are many wheelchair users though that invest in a heavy duty scooter for outdoor use, as they can be driven almost anywhere. Many people have seen the commercials for Rascal Scooters or any of the other types of mobility scooters and thought to themselves, wow that would really make my life easier. Mobility scooters are powerful tools for the elderly, as well as others who have difficulty walking for longer distances. However, if you actually call up their number, you are very likely to end up talking to a high pressure salesman, who is payed off of commission and therefore motivated to make a sale, much more than they are to help you find the right mobility scooter. So, rather than simply call up these companies, it is a good idea to learn about mobility scooters first and explore all of your options. That way, rather than leading you to a sale, you can lead the salesman to what you really need. 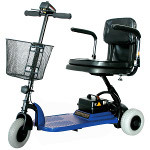 The mobility scooter is a special type of home medical equipment that provide a motorized platform to move its user from one area to another. That is to say, they are a type of mobility vehicle, similar in function to a wheelchair, but using a much different design. Mobility scooters are battery powered, running off of at least one rechargeable battery. Some mobility scooters can travel over 20 miles on a single charge, but when looking at a medical supply companies website, it is important to keep in mind there are a lot of factors that can affect a mobility scooters range. For example, a heavier rider will see a shorted range than a lighter one. Along the same lines, if the mobility scooter is driven up hill, the battery will wear out much more rapidly than if it is driven across flat ground. Other factors that affect range are the age of the battery, with it wearing down over time and usually needing replacement every 12 to 18 months, as well as how the battery is charged. Like all electronics, regularly and correctly recharging a battery is very important, with the first few months being the most important. So, make sure to follow the manufacturers instructions for recharging your scooter to ensure the best possible per-charge range. What Kinds of Mobility Scooters Are Available? There are many different types of mobility scooters, but they can basically be broken down into heavy duty scooters, travel scooters, and regular scooters. Heavy Duty Mobility Scooters are arguably the most fun to drive, because they have the highest weight capacity and are designed to be driven almost anywhere, including over off-road terrain. They have a reinforced frame, larger tires, higher top speeds, a larger per-charge range, and higher ground clearance. However, heavy duty scooters are not just designed for outdoor use, but have a much higher weight capacity. One downside to a heavy duty scooter, however, is their size, which makes them impractical for use in some homes. Travel Scooters are essentially the polar opposite of a heavy duty scooter. Where the heavy duty scooter is designed to be as powerful and strong as possible, the travel scooter is designed to be as light as possible. As a result, they are no where near as sturdy and lack a number of features common on other types of scooters, but they can be taken apart easily and placed in the trunk of a car. The main idea behind a travel scooter is that when it is taken apart, the individual pieces are light enough that they can be moved by the user without the need for a scooter lift. As a result, everything, from the frame to the seat, is minimized to reduce weight. Regular scooters form the middle ground, falling in between travel scooters and heavy duty scooters. They have many more features than a travel scooter, but are not as easy to transport, sometimes requiring a vehicle scooter lift. However, they are much more comfortable than a travel scooter and usually have a higher per-charge range, yet unlike a heavy duty scooter, they are usually small enough to work in all homes. What Mobility Scooter Manufacturer Should I Choose? There are quite a few different manufactures of mobility scooters, so it can be confusing knowing which one to select. 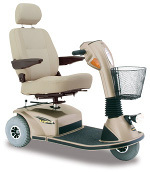 Inevitably two names stick out, however, as Golden Technologies and Pride Mobility are both known for their home medical equipment, which includes not only mobility scooters, but also lift chairs, adjustable beds, and electric wheelchairs. ShopRider is another popular manufacturer, which offers a less expensive option. Since there are so many manufacturers of adult scooters, it is important to compare the different electric scooters available to find the one that will best fit your needs and your budget. When comparing different scooters, make sure to look at the warranty offered, as well as how well known the brand is. For example, it is possible to get some really cheap no-name mobility scooters from overseas, but chances are, they won’t last very long and will be covered by a much less inclusive warranty that requires expensive shipping if something breaks. Moving around is often quite difficult for the elderly, especially among seniors who have arthritis. Since using a wheelchair can be quite strenuous, it is often not a good choice for seniors, especially those who intend to travel away from the home. Mobility scooters provide a nice middle ground between an electric wheelchair and a regular wheelchair, while also often being better suited for outdoor use. This is because, in most cases, a mobility scooter is significantly less expensive than an electric wheelchair, so often the cost of a scooter vs a wheelchair is a big selling point. The mobility scooter is not exactly a new medical device, with the first models being developed during the nineteen-sixties. However, it would not be until about twenty years later, during the nineteen-eighties, when their popularity really took off. While the functionality they offer is similar to that of an electric wheelchair, adult scooters have a different design, with a longer base that has a set of handlebars in the front and a seat towards the rear. The electric scooter is controlled using the handlebars at the front, which is called a tiller, usually allows the scooter to not only be turned, but also the speed regulated and the control of any extras, such as lighting or horns. Since the tiller is located in the front of the electric scooter, it can not be driven directly up to a table the same way you would an electric wheelchair. Instead, it is either necessary to exit the scooter and transfer to a chair or to drive the scooter up parallel to the table. To make it easier to transfer out of the scooter, the chair can be turned and some even come with automatic lifting chairs as well. There are many different models of mobility scooters, but they can typically be classified as either a travel scooter, heavy duty scooter, or standard scooter. Heavy Duty Scooters are the most powerful and are designed to support more weight, as well as for outdoor use. As a result, they usually have reinforced bumpers, larger wheels, stronger suspension, and many other features. However, as they are much larger than other types of scooters, a heavy duty scooter usually requires scooter lift to transport the scooter away from home, as well as not being as well suited for tight quarter indoor use. Travel Scooters are basically the direct opposite of a heavy duty scooter, with the focus being on making the scooter as lightweight as possible, so that it can be easily transported. This means they have fewer features and everything, from the tiller to the seat is designed to be as light as possible. A travel scooter can be taken apart easily and each individual piece is intended to be able to be easily lifted into a vehicle. Since a travel scooter is so light, they usually have the shortest per-charge range and a much lower weight capacity. Standard scooters form the middle ground, trying to blend the right amount of features, with the overall weight of the device. As a result, they are not as easy to transport as a travel scooter, but have a larger range, more comfortable seating, and generally a number of comfort features. Usually they can be broken down into more manageable pieces, as can heavy duty scooters, but they are still much heavier than a travel scooter. Another way that mobility scooters are classified is by the number of wheels they have, specifically four wheel mobility scooters and three wheel mobility scooters. In the case of 4-Wheeled Scooters, there is a more even distribution of weight across the base of the scooter. This makes them more stable, as well as being better suited for larger weight capacities and outdoor use. For this reason, most heavy duty scooters are four wheeled. Three wheeled scooters are not as stable, but they do have a smaller turning radius than four wheeled scooters. As a result, this makes them a better choice for indoor use. Also, since the front axle is smaller, they are also lighter, so many travel scooters use a three wheel design. Among the elderly, the mobility scooter provides one of the most valuable services for those who have difficulty walking. There are a number of different mobility scooter models available, as well as a number of different manufacturers, so it is sometimes overwhelming finding right mobility scooter, but when you know a little bit about them, it is not as difficult as it might seem. Mobility scooters have been around for over forty years, but it was not until the eighties that they really became popular and more common place. Today, mobility scooters, which are sometimes called electric scooters or adult scooters, are very popular and provide a lower cost alternative to an electric wheelchair. Below, you will find the answers to some frequently asked questions about these extremely useful senior mobility vehicles. Where Can I Use My Mobility Scooter? What is the Difference Between Three Wheel vs Four Wheel Scooters? What Type of Speed and Battery Life Should I Expect? What Extra Features and Accessories Are Available? What is a Heavy Duty Scooter? Who Are Some Popular Mobility Scooter Manufacturers? A mobility scooter is an electric vehicle that is used to carry a single occupant, typically both indoors and outdoors. They are similar to electric wheelchairs, except mobility scooters have a longer base, with the captain’s chair positioned more towards the rear of the scooter. A set of handlebars, called a tiller, is attached to the front of the scooter, which allows the scooter to be turned, as well as regulating speed, braking, and controlling the extra features, such as the horn and lights. The main difference between a mobility scooter and an electric wheelchair is the addition of the tiller. Electric wheelchairs typically use a joystick control that is mounted to the side of the wheelchair’s arm rest, which allows the wheelchair to be driven directly up to a table or bench. Mobility scooters, on the other hand, are controlled by the tiller, which prevents it from being driven directly up to a table. Mobility scooters also usually cost a good deal less than electric wheelchairs. Most mobility scooters are designed to be used indoors, as well as outdoors over tightly packed terrain. However, if you intend to use the scooter over loosely packed ground, such as dirt or sand, you may need to invest in a more durable mobility scooter. However, when driving over uneven terrain, even if it is tightly packed, it is important to be very careful in order to prevent the scooter from tipping over. One thing to keep in mind is how much room you have indoors, as some mobility scooters are more maneuverable than others. The manufacturer will provide a turning radius, which describes the smallest space the scooter can turn it. There are also environmental factors that can reduce the performance of the scooter. For example, driving a mobility scooter uphill will cause the battery to wear out quicker than when it is driven on flat terrain. Similarly, the weight of the rider also affect the per-charge range of the scooter, with a heavier rider reducing the range of the mobility scooter. One way that mobility scooters are classified is by the number of wheels that they have, specifically, either three wheeled mobility scooters or four wheeled mobility scooters. In general, a four wheeled mobility scooter will provide better stability and higher weight support, where a three wheeled mobility scooter will be more maneuverable. This is because the four wheeled scooter more evenly distributes the weight of the rider between the front and back of the scooter. Both the top speed and the per charge range, varies by model. However, most travel between 4-5mph and have a per charge range of between 8-10. There are, of course, exceptions to this, with some mobility scooters traveling over 10mph for distances of over twenty miles. One thing to keep in mind when considering battery life, is that the amount you use the scooter will have a direct relation on how often you have to charge it and how long the battery lasts. For instance, someone that only uses their scooter once every few days probably would not need to charge the scooter everyday. On the other hand, someone who drives several miles each day on their scooter would probably have to charge it each night. Environmental factors also play a part in battery life, with things like driving up hill or carrying extra weight causing the battery to wear down faster. Batteries do need to be replaced and depending on how much the scooter is used, this could mean replacing it each year or every few years. There are a number of extra features available for most scooters, which include things like cane holders, oxygen racks, and visibility flags. Often, some of these can be purchased cheaper at a bike store, as is the case with side mirrors and visibility flags, than you would be able to purchase them from a manufacturer. So, it is important to determine if it is a scooter specific accessory, which will only work with a specific model, or if it is an accessory that is generic, which will work with any type of scooter. 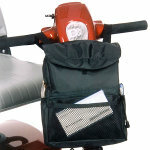 There are a number of bags that are also available, including armrest bags, under the seat bags, and back of the seat bags. Trays are also popular, which make it easier to eat, write, or work on a computer while using the scooter. Travel scooters are lightweight mobility scooters that are designed so that they can be quickly and easily dissembled into several easy to manage pieces. Often, they use quick release snaps that can be activated with a single hand and the heaviest piece weighs only around 30 pounds. The advantage of a travel scooter is that it can be stored quickly and easily in a plane, car, or other vehicle, without having to use a scooter lift. Most travel scooters are three wheeled, as this helps reduce weight. However, they are also usually bare bones in regards to included features, which helps to reduce weight. Travel scooters are also not able to travel as far on a single charge, nor are they able to support as much weight or preform as well outdoors as other mobility scooters. A Heavy Duty Scooter is one that is designed to support more weight and preform better outdoors than a regular mobility scooter. They typically are four wheeled, which provides the most stability and use air filled, pneumatic, tires, which improve suspension and off road performance. Heavy Duty Scooters are intended for outdoor use, so have larger wheels and a higher ground clearance, as well as having reinforced bumpers, extra large seats, and a number of other extra features. While Heavy Duty Mobility Scooters are well suited for outdoor use, have a very large range, and a much higher weight capacity than other scooters, they are much bigger than most other types of scooters. As a result, a heavy duty scooter might not work well inside of a smaller home and to transport it, a scooter lift would be needed. 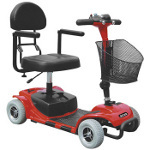 There are a number of mobility scooter manufacturers, but Pride Mobility and Golden Technologies are probably the most well known, with both companies having manufactured home medical equipment for over twenty years. While Pride Scooters and Golden Scooters are the most recognized, they also tend to cost more than other lesser known brands. ShopRider is a company that offers a number of mobility scooters, which are typically priced lower than Golden Mobility Scooters and Pride Mobility Scooters. Ultimately, if you decide not to go with one of the major brands, it is important to check for consumer reviews of the company and their scooters. Also, ensure that they provide a warranty for their scooter, which is similar to the length of a warranty on a name brand scooter. There are a number of very cheap scooters out there, but they will often have a very limited warranty, which means they should usually be avoided. It is not uncommon for a senior to have difficulty walking and getting around. Around the home, it is possible that not being able to walk for an extended period of time isn’t all that big of an issue and in many cases, a walker or rollator will offset these difficulties. However, going places like the grocery store, shopping mall, or even walking around might not be possible, so many seniors use mobility scooters. Mobility scooters are one of the most common types of mobility vehicles, which allow a senior to effortlessly get around. Many are able to travel over 10 miles per charge and some can travel even further on a single charge, with a range of over 30 miles. There are many different types of mobility scooters, but they can typically be divided into three distinct categories; Travel Scooters, Heavy Duty Scooters, and Traditional Scooters. Travel Scooters are very popular, because they are designed to be easily transported. They can be taken apart into several pieces, all of which are light enough for the average senior to lift, with the heaviest piece often weighing less than 30 pounds. This means that the travel scooter can be dissembled quickly and placed in the trunk or back seat of a car, without the need of a special scooter lift. While travel scooters can be very convenient, their lightweight comes at the cost of features. They also often have a shorter range than other scooters, are not quite as durable, and will typically have a lower weight capacity than a non-travel scooter. Where travel scooter are made with transportability in mind, heavy duty scooters are designed to be driven almost anywhere. As a result, they are very heavy and will very likely require a scooter lift to transport, but they preform very well over almost all terrains. They have a much higher weight capacity than other mobility scooters, offer reinforced bumpers, a higher ground clearance, a larger more comfortable chair, and larger wheels. They also have a much larger range and top speed, with some heavy duty scooters able to travel over 10 miles per hour. Many people who spend a great deal of time outdoors will go with a heavy duty scooter and they can be not only very practical, but also a good deal of fun to drive. However, they tend to have a rather large turning radius, which means that they wont do as well in very tight quarters, such as in a living room. This means that a heavy duty scooter is an excellent choice for outdoors and public areas, like the grocery store, but might not always be the best choice for use inside the home. The last type of scooter is the traditional scooter and this is sort of a catch all category. If it isn’t a travel scooter or a heavy duty scooter, then it is a traditional scooter. They are more durable than travel scooters, yet not quite as durable as a heavy duty scooter. Most traditional scooters can be easily taken apart, but the individual pieces will not be as easy to handle. For a senior, or anyone who has difficulty walking for that matter, a mobility scooter can greatly improve accessibility. These devices provide a cost effective alternative to electric wheelchairs and are very easy to use. Wheelchairs are very powerful tools that have a history dating back thousands of years. However, most of the technology behind the modern wheelchair, with of course the exception of the wheel itself, is much newer. Instead, the modern manual wheelchair based off of the E&J design, which is characterized by a lightweight hollow tubed frame, which can be folded when not in use. Today, manual wheelchairs remain incredibly popular, but the electric wheelchair is also a very common choice for the wheelchair user. Not too surprisingly, the modern electric wheelchair also has its roots in the E&J Wheelchair design. This is because the first electric wheelchairs were simply E&J wheelchairs that had been outfitted with an electric motor. Early manufacturer would sell electric conversion kits designed for use with the E&J design, but today the electric wheelchair has a significantly different design that to that of a manual wheelchair. Most modern electric wheelchairs, which are often called power chairs, feature a relatively small base, which is covered in molded plastic. 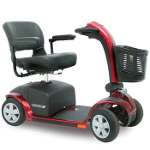 The base contains the electric motor, wiring, wheel base, and rechargeable batteries of the wheelchair. Some are quite small, while others have a much large wheel base, resulting in a much larger wheelchair. Attached to the top of the wheelchair base is a chair, which can usually be swiveled to make entering or exiting the wheelchair much easier. The reason the base of an electric wheelchair is so small, especially when compared to that of a mobility scooter, is that by design a wheelchair must be able to be driven directly up to a table or desk, without requiring its user to transfer to another chair or a bench. For heavy duty electric wheelchairs, the base is usually larger, but it is still designed so that the power chair can be driven directly up to a desk. The number of wheels on a power chair is one way that they are classified. Rear wheel drive wheelchairs usually have a set of wheels in the front and a set of wheels in the back. The rear wheels are responsible for moving the wheelchair and are slightly larger than the front wheels, which are typically there for support only. 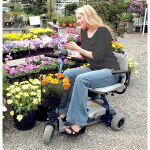 One of the advantages of a rear-wheel drive power chair is that they are very stable. The weight of the user is spread out more evenly around the base of the chair, resulting in a very stable wheelchair. The Mid-Wheel Drive Wheelchair actually has three sets of wheels. The front set and rear set are much smaller and are designed to provide stability and support. It is the mid wheels that are responsible for moving and turning the wheelchair, which offers the advantage of greatly improved maneuverability. This is an important feature, as many wheelchair users rely on their power chair for indoor use. 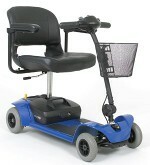 However, it is at the expense of the extra stability offered by a rear-wheel drive power chair. This is because most of the weight is placed on the mid-wheel, which significantly changes the wheelchairs center of balance. This is not to say that mid-wheel drive wheelchairs are unstable, simply that they are less stable than rear-wheel drive wheelchairs. As a result, for outdoor use or high weight capacity, a rear-wheel drive power chair will usually provide better service. One of the most common types of mobility vehicles used by seniors to improve accessibility and make it easier to get around is the electric scooter. These devices have been around for over fifty years, but they did not become popular until the 1980′s, when the price of electric scooters was decreased. Electric scooters, which are most often referred to as mobility scooters or adult scooters, are intended to be used by those who have difficulty walking for extended distances. The user sits in a chair that is mounted to the base of the mobility scooter, controlling it by a set of handlebars, called the tiller, that extend from the front of the device. Using the tiller, which can be adjusted to accommodate people with different arm spans and of differing size, the senior can control the direction of the mobility scooter, its speed, and any other components the scooter may have, such as its headlights. The tiller extends from the front of the mobility scooter, while the chair is positioned more towards the rear. As a result of this design, it is not possible to drive a mobility scooter directly up to a table in the same way you could a wheelchair. Instead, it is necessary either transfer to an actual chair or parallel park the mobility scooter next to the table. This is the major difference between mobility scooters and electric wheelchairs, making mobility scooters more practical for those who are able to walk on their own. However, there are some wheelchair users who like to use mobility scooters for outdoor use, but do not rely on them for their daily activities. Among wheelchair users, the heavy duty mobility scooter is most popular, as it is designed to be driven over almost any type of ground, has a much larger per-charge traveling distance and top speed than most wheelchairs. Like electric wheelchairs, mobility scooters use a rechargeable battery system for power. Depending on the model and type of mobility scooter, the range of these devices can greatly vary. Typically lower end mobility scooters have a range of less than 5 miles per charge. Higher end scooters have a much larger range, usually between 10 and 20 miles per charge, with some heavy duty scooters exceeding 40 miles in a single charge. Usually the price difference between a low end model and one that has a better per charge range is not very large, especially when you consider the difference in quality. Some mobility scooters use a battery pack system, which allows the battery to be removed easily by simply pushing a release button. Others use a battery system more similar to an automobile, which has wires that must be removed in order to replace the battery. One of the main advantages of a mobility scooter with a battery pack is that users can purchase an extra battery pack for the scooter. When one battery pack runs down, they can then quickly switch it out and be ready to go again, leaving the other battery pack to charge. This is popular amongst those who do a great deal of traveling with their scooter or consistently drive further than its single battery range.